Are we looking at HTC’s next GUI? Could be! It might be called “Manila” too. Doesn’t it give you goose bumps? Oh really? It didn’t give me goose bumps either. I just said that because I figured there was something wrong with my feelings again. 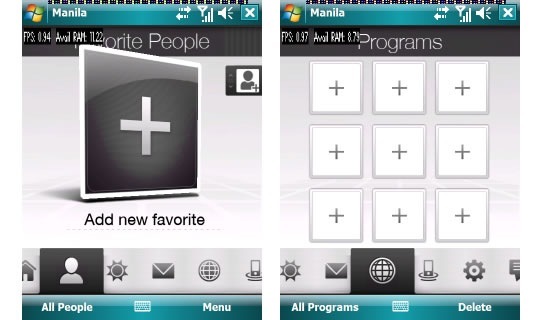 I have zero information if this screenshots are legit or just a simple PhotoShop result but according to Swiss Windows Mobile fan-site “Mobile-Devices.ch”, bellow you see some screenshots of HTC’s upcoming/next TouchFLO GUI which is code-named “Manila”. No further information given so it’s not clear if it is real (really from HTC), an HTC development environment or really HTC “TouchFLO 2.0”; also Mobile-Devices.ch hasn’t mentioned where they got the information from but from what you can see from the screenshots, it could be real indeed. So there you have it. Grains of salt and all that good stuff.